Famed Lotus fourder Colin Chapman had a cruel reputation for saying that a race car only has to survive through the checkered flag, but he’s not wrong there. Fellow British marque Aston Martin proved that spectacularly at today’s 6 Hours of Shanghai by rolling into the winners’ line-up on fire. 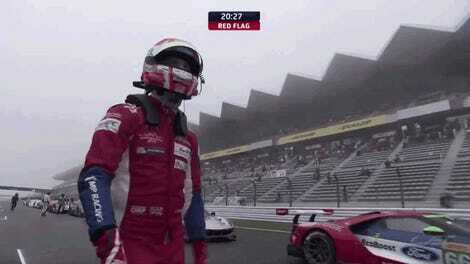 The World Endurance Championship lines its four classes’ winning cars up for display after a race is over. The No. 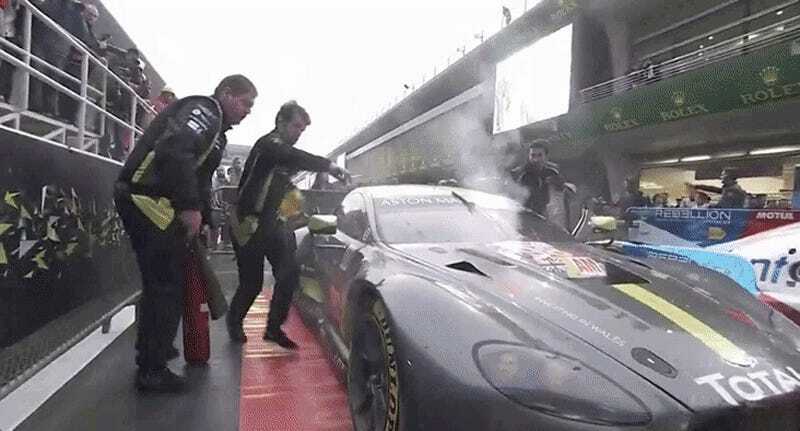 98 Aston Martin won the LM GTE Am class, so it cruised right into its assigned parking spot—smoking. Commentators noted that the Aston’s in-lap looked slower than usual, so they weren’t surprised it was having a problem. 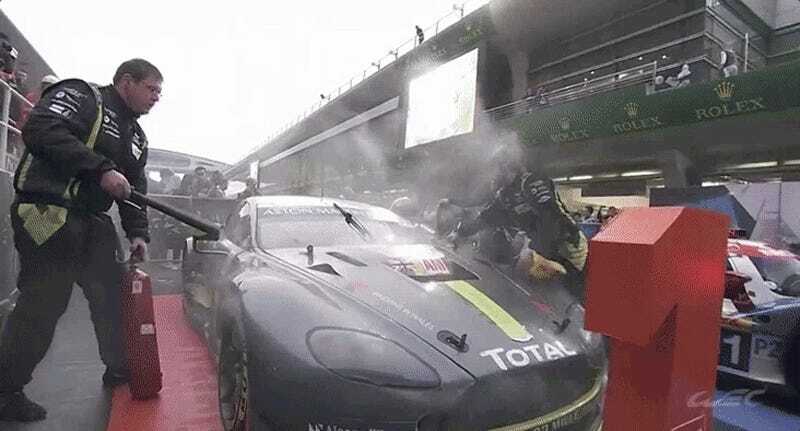 Immediately after it pulled in, Aston Martin crew members opened its hood and started spraying fire extinguisher in the engine bay. Unfortunately for the No. 98 Aston, they have one more race to go before the car’s off the hook: the season-ending 6 Hours of Bahrain, which kicks off just ten days from now. Ouch. Fortunately, today’s win gave the No. 98 a ten-point championship lead going into that season ender, so I think they’ll be okay. This was the No. 98's third win of the season and Aston Martin’s 50th win since the team started in 2004. The No. 8 Toyota TS050 LMP1 took the overall win at Shanghai, but the 2017 season titles were awarded to Porsche. A Porsche 2-3 result was enough to score them the 2017 manufacturers’ championship. The No. 2 Porsche 919 team came in second, which won drivers Brendon Hartley, Timo Bernhard and Earl Bamber the 2017 drivers’ championship. Toyota would have forced Porsche to race them for the 2017 championships in Bahrain, but contact between Toyota’s No. 7 TS050 and the No. 91 Porsche 911 RSR in the race’s final hour took the No. 7 out of contention. The No. 7 got a 10-second time penalty for causing the collision. Toyota lost out on a 1-2 finish as a result, and Porsche took home the season titles. Toyota and Porsche have both won four races each in the WEC’s top LMP1 class, but as Porsche won Le Mans and Le Mans is worth more points, Porsche was able to eke out a season title before the final race. In the LM GTE Pro class, Ferrari took home the inaugural GT World Endurance Manufacturers’ Championship, with third and sixth place finishes in their cars. Here’s the highlight reel from the race, which was fun but definitely an overnight affair for those of us watching in the United States.